My custom couture gown designed and made by the most incredible designer Steven Khahil for my wedding in February 2019. This dress is simply too stunning to be left in a box forever, it must be worn by another beautiful bride. It is a strapless, mermaid style gown that is extremely flattering and figure-hugging to the knees. With a beautiful long train that has button and a hook so that the skirt can be hooked up for dancing & can be held when walking. The gown is made up of 3 layers. 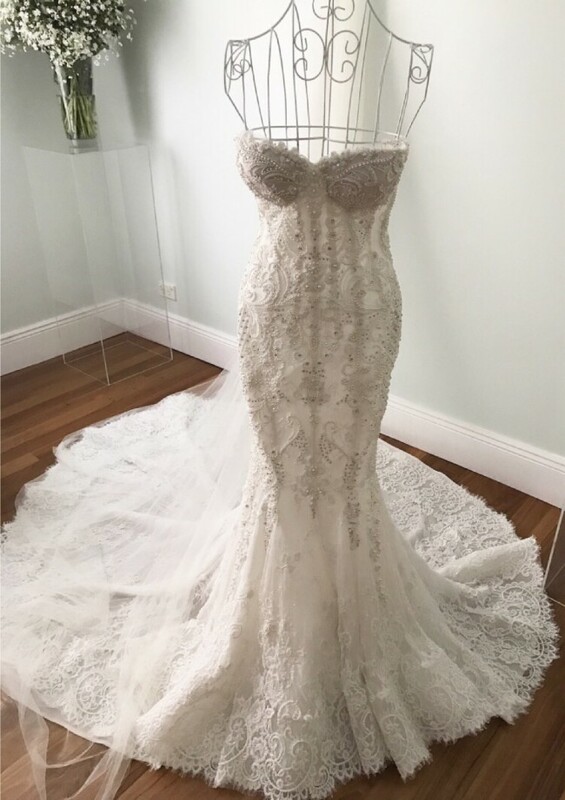 The first layer of the gown is a beautiful French Chantilly lace, the second layers are a soft weightless tulle and then the top layer is a gorgeous hand- beaded lace with pearls and crystals throughout the whole dress to the very bottom. I flew to Sydney for this amazing gown, I am location in Melbourne VIC. You are welcome to message me to enquire or arrange a time to try on the gown otherwise international delivery will be available. I hope the next bride who wears this gown feels as amazing as I did. I had to get the breast area altered as I got breast implants 2 months before my wedding date. Once you send a message, Tia can invite you to purchase the dress.